Grape lovers everywhere will be thrilled with this Grape Nic Salt from Mi-Salt. Juicy fresh grapes caress your taste buds while Mi-Salt's nic salt formula creates a super smooth inhale, giving you a satisfying flavor and feel every time. 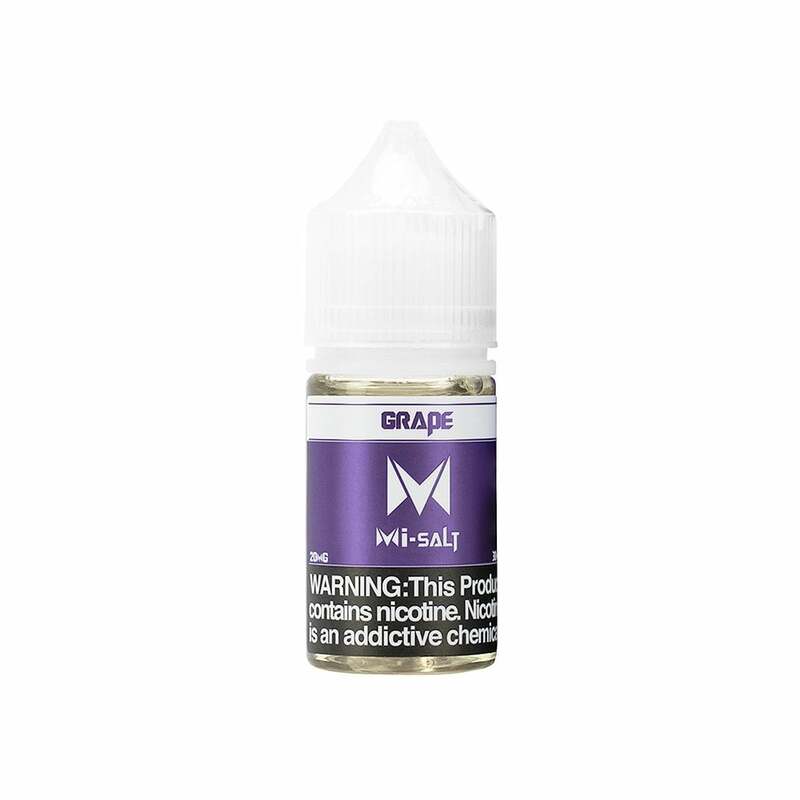 Mi-Salt nic salts are available in 20mg (2.0% nicotine) and 40mg (4.0% nicotine). Mi-Salt nic salts are not compatible with sub-ohm devices. Tastes just like grape tootsie pop to me. The consistency is awesome. Much easier to fill with that my other salts. Bottle also has pointed tip which is nice. My old “I love salts - grapleberry” is still better but this is ok. A nice backup. Tastes like grape juice in my Mi Pod but not as good in my Suorin Air device- strangely it had a weird chalkiness in the Suorin. Could just be the device. Otherwise it makes my mouth water. Grape is no too strong tastes like grape but I dont get where some reviews say it tastes like grape soda? It could be more grapy for me. But it does definitely tast like grape. Awesome taste like a Grape Fanta grape soda drink, if you want grape here it is really clean and great tasting eliquid. Tastes just like Concord grapes, not artificial grape flavoring. I really like it! This is my first grape and WOW it is good. Tastes like grape soda! The most amazing grape to smoke. Really taste like real grape.